At 1.30am the lights come on as there are just 2 hours to go until we land in Australia. Hot towels are offered to freshen us up and before too long breakfast is served - fruit and rolls with jam and butter. Overnight was the start of daylight saving in Sydney so it's around 6am when we approach the airport. There's an amazing orange red sunrise outside and a sense of anticipation begins to build that our 3 week holiday is all ahead of us. We land 40 minutes early and whiz through the epassport queue, pick up our luggage within a few minutes and clear customs - so we are outside the airport and in the early morning sunshine by 7am, just 5 minutes after we were actually due to land. Our early landing and the daylight savings have caught Serena and Fiona on the hop as I text to say we are there and they say they are on their way. But we are in no hurry and sit outside where it is comfortably warm and watch the world go by until we see Serena. You may think at this point that there'd be an emotional reunion as we haven't seen each other for some time, but actually it was only last year that they surprised us all by coming to jolly England for a holiday - so it really hadn't been that long at all. Needless to say we were very happy to see her and likewise I expect she was pleased that we'd at last made it over to see her in the country she now calls home. We find Fiona and Perry in the short stay car park - Perry has certainly changed in the year and has got significantly taller as 11 year olds tend to do. The girls have decided to hire a car for our visit as they deem their normal car too small for 5 people and luggage. We had told them not to bother but having tried to squeeze the suitcases in the boot it just goes to show that it was a very good idea as there's no way we'd have got everything in a normal size car. Fiona and Serena tell us that we may as well head straight into the city as it is early and quiet and they want to take us somewhere they take their first time visitors. 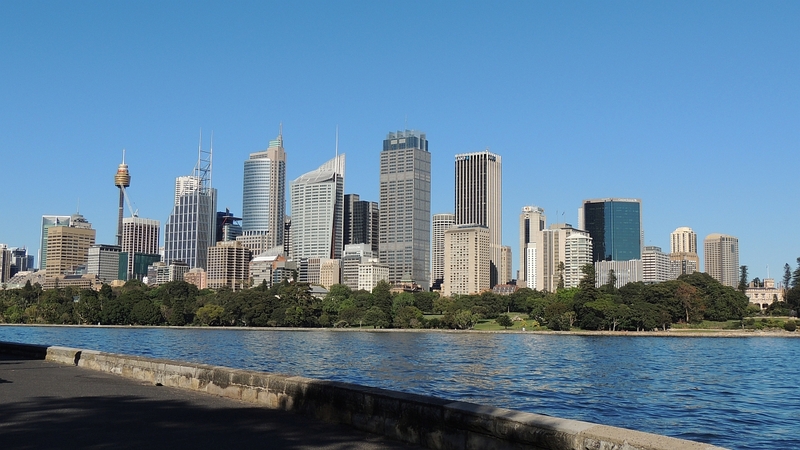 The streets are very quiet but with the sun shining, the beautiful buildings of Sydney and skyline of the business district we can already tell what a fantastic city this is. Fiona drives down Mrs Macquarie's Road and rounds the corner and then we can see in front of us both the Sydney Opera House and the Harbour Bridge. 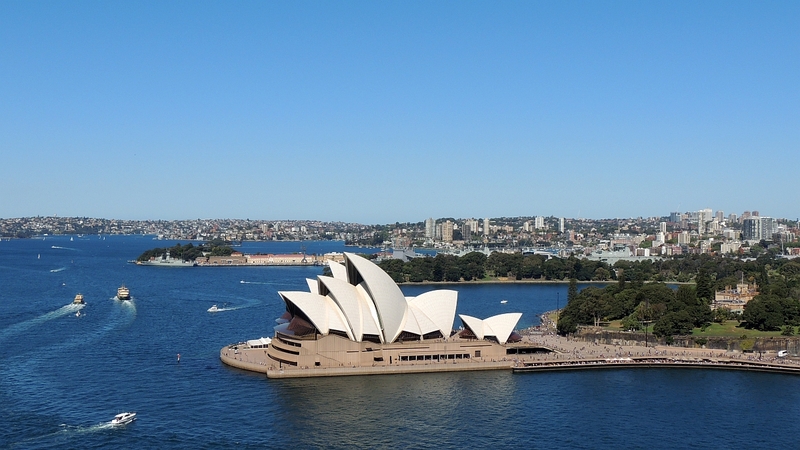 Wow what a stunning view, boats bobbing on the harbour, the tall skyscrapers glinting in the sun to one side and the magnificent Opera House with it's iconic shape standing framing the view. 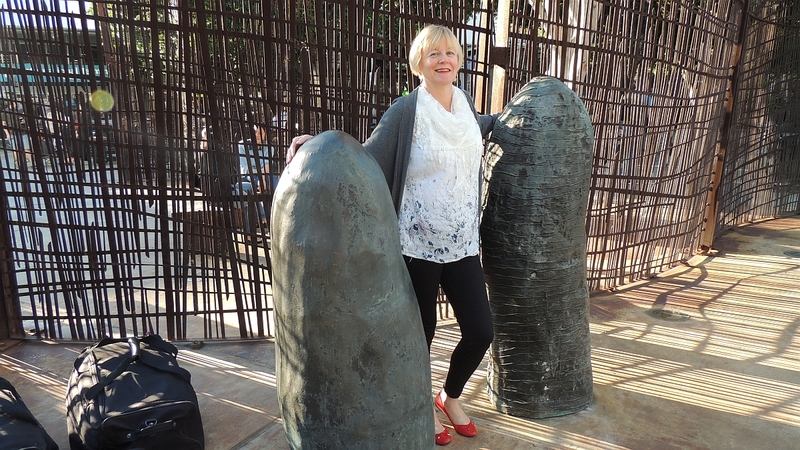 We get out of the car and take numerous photos and then have a wander around and see Mrs Macquarie's chair - a sandstone rock carved into a bench which was cut by convicts in 1810 for Governor Macquarie's wife Elizabeth. 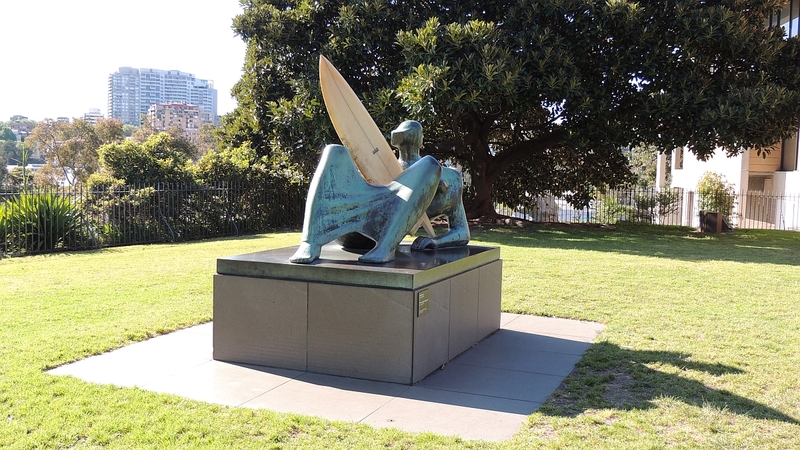 Back into the car we drive by the Art Museum where we see that some wag has put a surfboard on a Thomas Moore Sculpture that is on the front lawn. 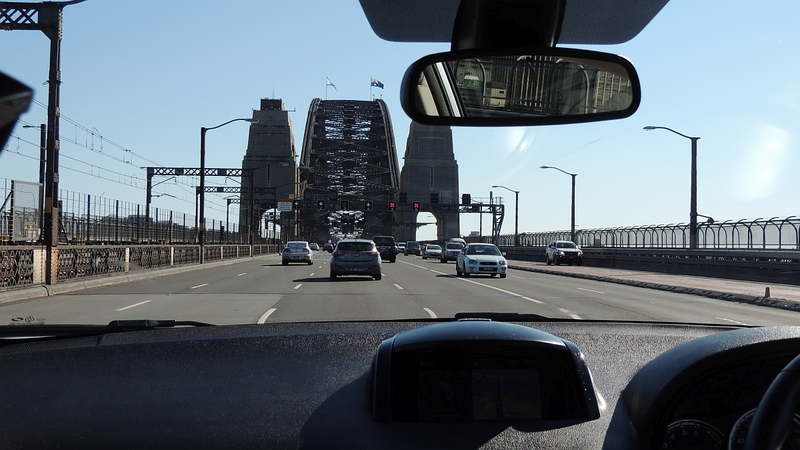 Drive through more of the city and then over the Harbour Bridge to Marsfield where Serena, Fiona and Perry live. What a lovely house in a quiet cul-de-sac with views over a park from the rear. This will be our base for the next 3 nights. The smell of jasmine and eucalyptus from the plants and trees linger in the warm Australian air - as we explore the garden and house. There are also colourful Rainbow Lorikeets and noisy mynah birds in the surrounding trees. Bizarrely the mynah birds take great joy in dive-bombing Serena and Fiona's cat - who frantically run and hide to try and avoid them. We take the short walk to the park and Perry shows us his new baseball bat. Obviously we all have to have a go batting and bowling - needless to say some are more successful than others! Back to the house we change before heading back into the city. We park in the Opera House car park which is underneath the structure - as we emerge we meet the hustle and bustle of people drinking, eating and chatting in the outside area of the Opera House Bar. We go to the Museum of Contemporary Arts cafe for something to eat and enjoy a shrimp and chorizo rice salad with beer which was very good. 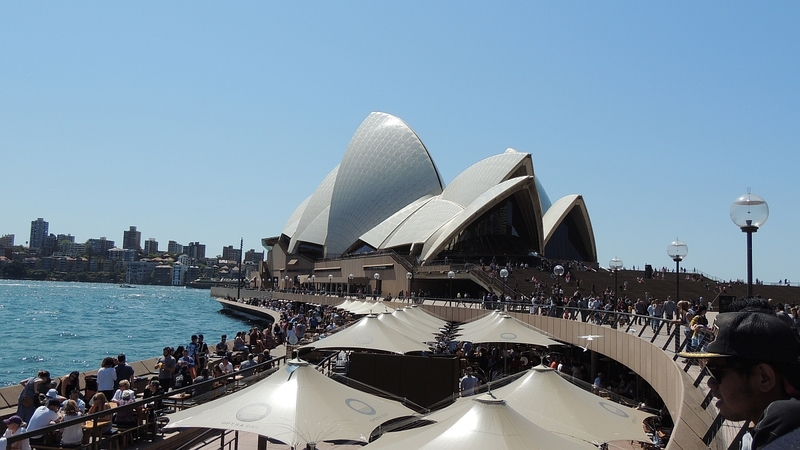 There are some great views from the outside terrace of the Opera House and Harbour Bridge. We take a short walk round the Rocks area where there is a funky street market selling individual crafty items. 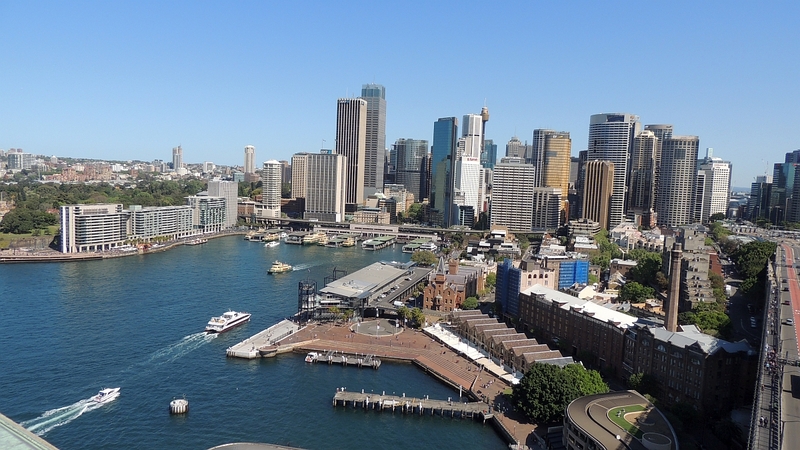 The architecture in this area is very attractive and they've renovated old warehouses and created a lovely area to spend time looking in all the shops and galleries, and supposedly two of the oldest pubs in Sydney are located here. Unfortunately we didn't have time to acquaint ourselves with their wares but we've put that on the "to do" list for next time. 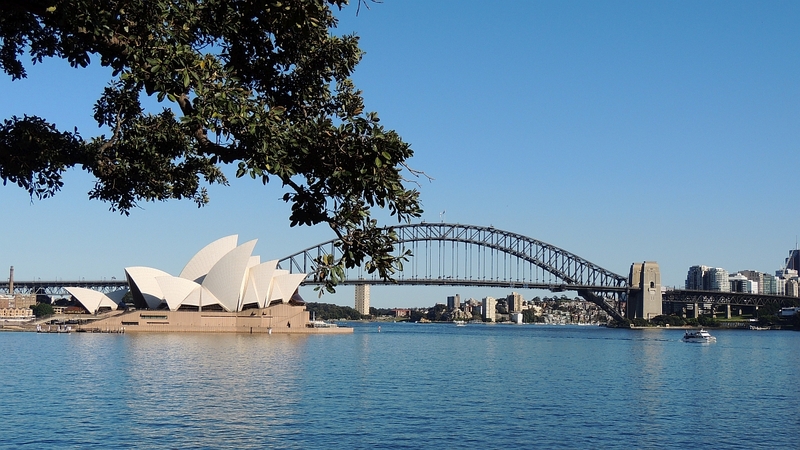 Fiona then decides to have a break whilst the four of us head up to the Harbour Bridge to do the Pylon lookout. 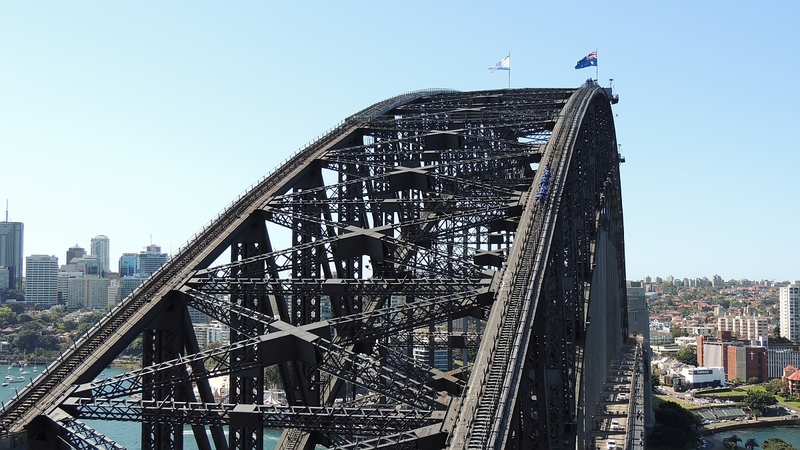 This is reached up some 200 stairs and costs $13, on the way you pass some historical displays all about the building of the bridge and lots of information as to how it was done, costs etc. From the top the view was stunning - over the whole of Sydney and on the far horizon the distant sight of The Blue Mountains could be seen. 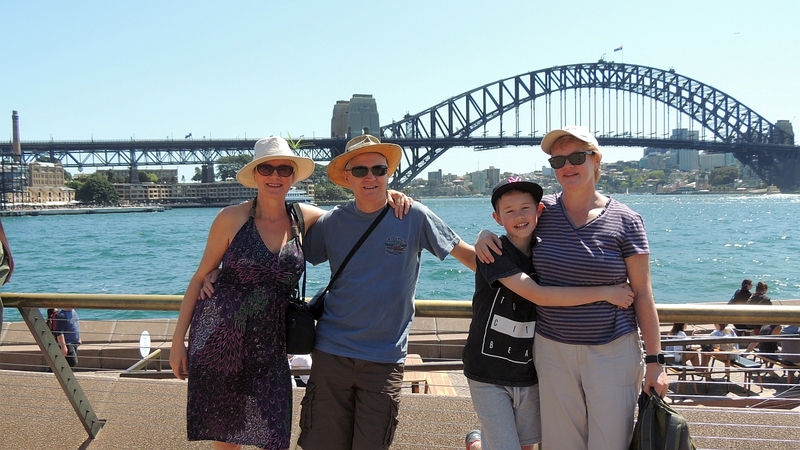 We took lots of photos and video and enjoyed seeing a different view of the harbour and it's surroundings. Head for home with a stop for beers and Fi prepares supper - a fantastic barbecue of lamb cutlets, T bone and sirloin steaks served with a delicious warm potato salad and green leaf salad. Pudding is a traditional fresh fruit pavlova. We try our hardest to stay awake and play some games with Perry before succumbing to the jet lag and head to bed at 9pm.